Run in the morning. Get it over with! 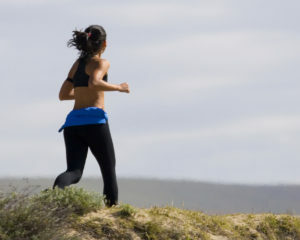 Going for an early run creates “good energy” for everything we need to accomplish on any given day. When we take care of ourselves first, we can take care of everyone and everything else. Aside from the good feelings, running early also helps jump start our metabolism to burn calories at a higher rate all day long. Our body wants to move after 8 hours of sleep. It’s difficult for many of us to get out of bed early for a run, but we never seem to regret it. Wear identification. Here’s a no-brainer. If we fly solo, we should always wear some sort of ID. Anything can happen, and it’s better to be safe than sorry. An ID bracelet or lace tag is easy to pop on. Wear shoes and gear that fit. Another easy one. Running in gear that doesn’t fit correctly can make a run more difficult than it has to be. It can be hard enough to muster the resolve required to lace up for a run, but when something is uncomfortable or hindering us in any way, it defeats us before we start. Why do this to ourselves? At a real running store, get fitted for gear by an expert. Why drop a ton of money on stuff that doesn’t fit well or feel good? Slather on the sunscreen. All year long, we should be spraying our face, our arms, and any other exposed skin with sunscreen. Sun damage is real, and it takes mere minutes to get too much. We can counter the “leather-skin” look by wearing sunscreen and/or some sort of hat. Always. Vary the route. “Different way, different day” is a great rule of thumb. If you’re like me, you have several running routes mapped out around your neighborhood for various distance and hill challenges. Varying routes is a powerful tool to combat boredom. It’s also a way to stay safe. When we mix up our routes and running locations, we are less likely to be attacked by someone who is watching. Run with a partner. A lot of us are soloists – but it’s nice for motivation and regularity to run with a partner. Try to find a running friend with a similar pace and schedule. Sometimes the only motivation we need is knowing someone is waiting for us. Carry water and fuel. A small water bottle that you can strap to your hand, or your waist belt, can be a run saver! I love sipping water as I run. It keeps me hydrated and motivated. I sip water at certain points, essentially setting up “mini” goals for myself. Every half mile or so, I take a swig. It keeps me moving. Same goes for fuel. Little chews or Gu packets help me on longer runs. I think of them as little rewards. Running doesn’t seem as difficult if I’m allowed to eat and drink along the way. Stay on the left side of the road. Such a simple concept, yet so many of us make the mistake of running on the right side. Granted there are times when we can’t see around a corner and we have to switch sides for a short bit, but it’s really important to get back onto the left side, against traffic, as quickly as possible to avoid an accident. So many people text and drive and they will not see you. It’s up to you to see them coming and react accordingly. When we are watching the behavior of a car coming at us, we can react quickly if necessary. Watch the temperature. Too hot, or too cold – neither is ideal for runners. I’ve tried to run in extremes and I’m always miserable. Hot weather is the worst, especially when it’s humid. Stick to the treadmill on days when temperatures hit extremes. Turn the music down. Or, wear just one ear bud instead of two. Some of us like to zone out when running. Music keeps us pumped up and moving, but it can be hazardous if it’s too loud. It is always important to be safe. Tell someone where you are going. We should always tell someone where we will be, and what our intended route will entail. Time estimates are good too. We shouldn’t rely on cell service, or being in a position to make a call. Having a running buddy we can text is ideal. Someone should always know where we are going. Don’t over train. We must learn to listen to our bodies. After running for several days straight it might be time for a rest, or for some sort of cross training session. Bodies need to recover! We can avoid injury and burn out by simply resting a day. We don’t lose training momentum by resting. In fact, it makes our next workout more productive. Don’t just run. Along the lines of not over-training, we can increase our fitness level and speed by cross training. Lift weights, go to yoga class, enjoy a nice swim! All of these activities improve our running. Mixing it up is a boredom beater. Doing other forms of exercise creates muscle confusion, which makes us stronger runners. A smart runner is a happy runner!